Fabricate your own custom intercooler and intake assemblies using Vibrant Performance Aluminum Tubing. These mirror polished T6061 Elbows and Straight Aluminum are all 1.5mm thick and available in sizes ranging from 1 1/2” to 4” O.D. Great for welding. 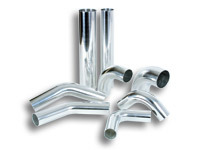 Fabricate your own custom Intercooler Pipe Assemblies or Air Intake Kits. Great for customized exhausts or intercooler piping.